Todd Peterson, along with his wife, Carol and their children, Robert (Robby) and daughter, Katherine (Katie) joined Lakeview UCC in 2006. At that time Robby and Katie were Mason High School students; Todd was working for Harris Corporation as an electronic engineer, and Carol was working in schools in Warren County, through the Warren County Mental Health Board. Since 2006 a lot of things have changed for the Peterson family. 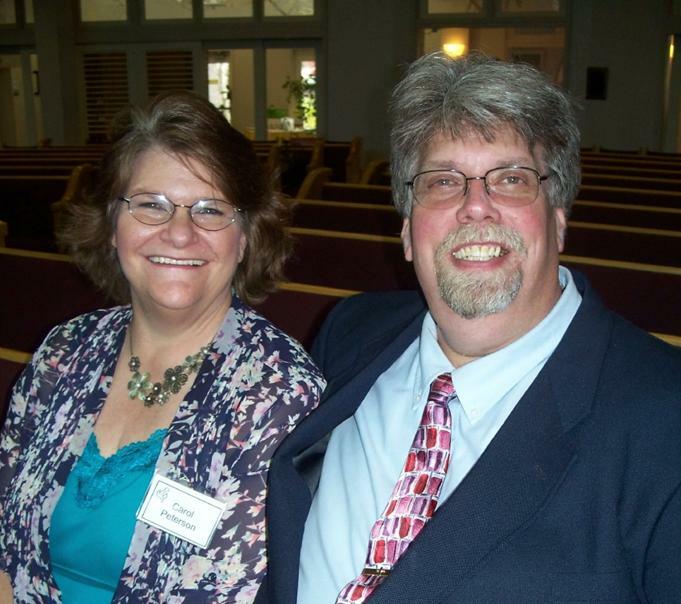 Todd became a licensed minister through the Southwest Ohio Northern KY Association of the UCC (SONKA) in 2010. He then enrolled in Bethany Theological Seminary in Richmond, IN. While in seminary, he was called to be the part-time pastor of Lakeview in 2013. He received his Master of Divinity from Bethany in 2014 and was called to be the full-time pastor of LUCC, pending his ordination, which occurred in October, 2014. Todd and Carol now live in Loveland. Carol works in customer service for Kohl’s in South Lebanon. Robby has graduated with a Bachelor’s in business administration from Northern Kentucky University and is employed by Nike. Katie is completing her Bachelor’s degree in psychology at University of Cincinnati. Carol and Todd have a lot of education under their belts, with Carol having degrees in theology and elementary education; and Todd having undergraduate degrees in theology and electronic engineering. They met while attending a Bible college in Emporia, Kansas. Carol is originally from the Bay Area of California, and Todd grew up in South Dakota. After leaving Kansas, they moved to Minnesota and then to Richmond, IN. Robby and Katie were both born in Indiana. The family moved to Mason in1999. Todd was raised in the American Lutheran Church, and Carol had no church affiliation in her formative years. While Todd was an undergraduate student and for some time after college, he was a leader in a home-based Bible fellowship ministry. For years after this Todd and Carol searched for a church home. They were still searching when Robby saw a TV ad for the UCC in 2006, an ad emphasizing the inclusive philosophy of the UCC. He went to the UCC website and located Lakeview. The Petersons first attended Lakeview in the spring of 2006, joined as a family soon thereafter and dove headfirst into church activities. Carol first volunteered to be the Ways and Means chair. Katie and Todd joined the choir. Robby volunteered to be the sound technician. Then Todd volunteered to fill a vacancy as Worship and Music Committee chair and thus became a member of Church Council. Katie was chosen to be a SONKA youth representative on a trip to Kenya in 2009, and as a young adult representative on the Kenya trip in 2014. Katie and Robby have both worked and volunteered many hours at the inner city mission program of Washington UCC in Cincinnati, serving in many capacities including tutoring at the Homework Club and working in the Summer Program. Katie worked full-time as a Vista Volunteer at WUCC before returning to college full time.